I'm turning into the Peter O'Toole of predictions for the Kennedy Center Honors: so far, out of the thirty-three names I've suggested for potential Honorees, so far none have been taken. To my mind, it's a disastrous run. However, the KCH committee has found time to honor someone who has done more to wreck American culture than anyone else by making Americans far more self-centered than they've ever been in their history. Well, they had to salute the person who selected the President for us. As it stands, I don't have an issue with the recipients. I'll be honest: first, I don't know who Barbara Cook is, but it should be remembered Broadway stars aren't for the most part household names. Still, I figure to have been a Broadway star for so long deserves some recognition. I also sheepishly put Sonny Rollins in the "he's still alive?" category. However, as someone who is feeling his way across the world of jazz, I celebrate any recognition of this most American of musical styles. In regards to Ma, frankly the question was never IF but WHEN he would receive a Kennedy Center Honors. This is the biggest no-brainer of the group. I would like to point out that at 55, he's the youngest Honoree of the group (and a good forty years older than one of my recommendations: Eli Wallach). It also gives me hope that soon, the Kennedy Center will honor one of my favorite musicians: guitarist Christopher Parkening. Ma is the cellist of our time, and probably the only cellist anyone can name. Side note: I remember a clip for a spy show called She Spies where Henry Gibson was a guest star. He played a villain who is holding our heroines hostage, demanding to know who hired them. I think it was star Natasha Henstridge who responds, "Yo Mamma", to which a confused Gibson replies "Yo-Yo Ma? You mean the cellist?" It was a funny bit, and let's face it: A.) who else would be able to get a shout-out like that, and B.) exactly how many people would get the reference? Meryl Streep: the Actor's Actress. She is one of the few actors who can handle accents without it sounding forced, fake, or flat-out ridiculous (Angelina Jolie and Johnny Depp and my secret love Mia Wasikowska can do likewise I think). Normally, I'm not a fan of accents; both times I remember Brad Pitt trying to sound like anything other than what he is (a Midwesterner) were so awful: his Austrian efforts in Seven Years in Tibet and that bizarre pan-European tone for Troy to my mind were awful actor indulgences. However, I never question that Streep isn't Danish in Out of Africa or Australian in A Cry in the Dark or Polish in Sophie's Choice. Sure, she' had some awful films (Death Becomes Her, She-Devil, Rendition, Lions for Lambs: the last two in an effort to find the biggest "I really hate the second Bush Administration policy" script), but on the whole, she just is brilliant in nearly everything. Finally, Neil Diamond. Honestly, who doesn't like Sweet Caroline or feel a little jolt when they hear America? Looking over his catalog, there are many good songs, songs that would inspire respect in many circles if not for the perception of Diamond as something of a lounge act (the sparkling costumes, perhaps?). The remake of The Jazz Singer did not help (the soundtrack is great, the movie...well, maybe if they'd called it The Rock Singer it would have helped a little). I don't know why he is hated in so many circles. I don't hate him because I don't know that much about him, but perhaps this recognition will show that maybe he is a good musician who has been unfairly beaten up. 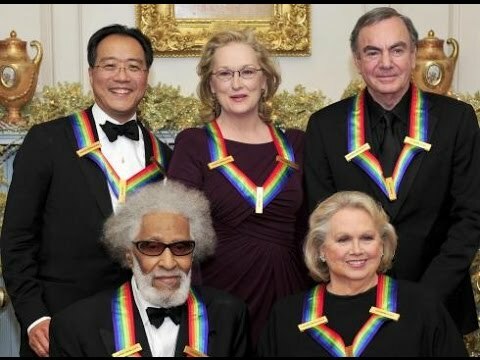 Still, while I think the recognition for the 2011 Kennedy Center Honors are quite good, I can't help feeling a bit sad that The Betty White is still not a recipient. However, I will keep putting up suggestions, knowing that eventually, the law of averages will favor me and I'll finally get one right. January 2018 Update: Mary Tyler Moore, Peter O'Toole, Maureen O'Hara and Eli Wallach, all worthy of recognition, have since died. Four other recommendations have been selected: Dustin Hoffman, Gloria Estefan, Herbie Hancock, and Lionel Richie. See: sometimes I do know a bit more than they do.